Subject: After Netflix Stock Split, Should I Buy NFLX? The Netflix stock split will take place tomorrow (Wednesday, July 15). It's a 7-for-1 stock split, which means shareholders of record as of July 2 will receive six shares of Netflix Inc. (Nasdaq: NFLX) for every one they previously owned. The biggest change we'll see following the Netflix stock split is the price of Netflix shares. After a 7-to-1 split, the price of shares will be divided by seven. So if shares close today near $700, where they currently trade, they will open tomorrow near $100. Bringing down the price of shares is one of the primary reasons for the Netflix stock split. According to FinViz, NFLX has the seventh most expensive share price on American exchanges. But it's important to remember that even though the price is much lower, the value of NFLX shares is unchanged. That's because the number of shares on the market will increase dramatically. The company plans to up its share total to 5 billion. In a filing from April, Netflix officials also said issuing new stock would allow better flexibility for dividends, equity financing, and acquisitions. Netflix would also have a comparable share total to other major tech firms. Apple Inc. (Nasdaq: AAPL) has 5.8 billion shares outstanding, while Microsoft Corp. (Nasdaq: MSFT) has 8.1 billion and Facebook Inc. (Nasdaq: FB) has 2.3 billion. Netflix is now worth nearly $41 billion. That's more than CBS Corp. (NYSE: CBS), Viacom Inc. (Nasdaq: VIAB), and even Sony Corp. (NYSE ADR: SNE). Now that the Netflix stock split will bring down the price of shares considerably, new investors will wonder whether they should buy NFLX. The Netflix share price has soared more than 105% in 2015. 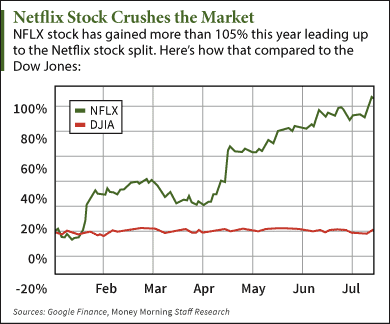 Should I Buy NFLX Following the Netflix Stock Split?